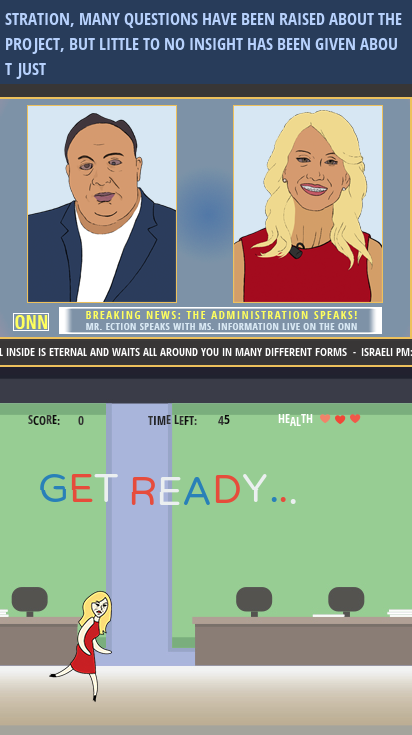 Here's our game! 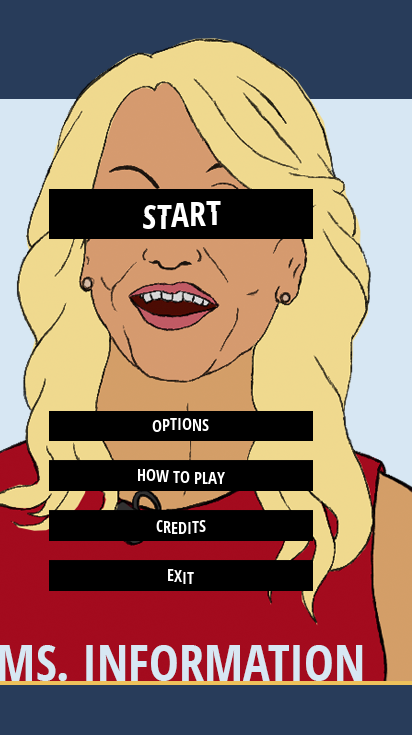 It's a simple 2 button runner where you play as a political pundit on television. Your interviewer is asking the tough questions, and the best way to stay on message and keep approval ratings up is to dodge those questions! We hope you enjoy. It's been a heck of a week. The day before the compo I managed to accidentally cut a chunk out of my left index finger in the kitchen, requiring a hospital visit and a 9-finger typing strategy. My teammate's car broke down on the way home from work on Wednesday. And somehow, we still managed to finish something! The best part about it in my opinion is the concept, the wonderful art and music made by my teammates, and all the jokes we came up with. 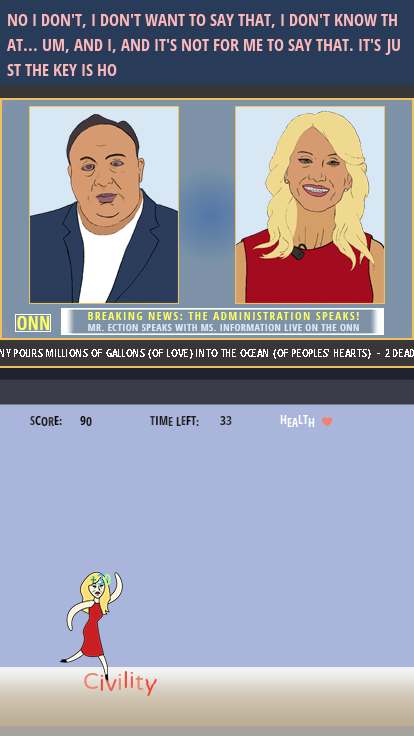 We decided to go with a mobile aspect ratio this PyWeek just for fun, but after it was all said and done, for the first time, we're hoping to continue developing a game AFTER PyWeek. Maybe you will see Ms. Info on the Google Play store after we flesh things out a bit more! Who knows! I think we did really good with music this time around. We each contributed a song, and of course mine is really simple and brutish, but I think the important thing is to just let the creativity flow and not get too caught up in making everything perfect. I think 3 songs is a lot for a week effort, they are much longer than we normally can do as well! I was doing really good with code quality at the beginning of the compo. Use of a FSM library really helped with stability and scene changing, but as soon as crunch time hit most of my diligence to keeping it clean went out the window. Thankfully, the base that the game-play prototype sits on is really solid, and I don't TOTALLY dread going in and cleaning it up, which is a first for me personally. Can't wait to play all the games. It looks like we only had around 20 entries this time, and I'm totally fine with that, it gives me more of a chance to really enjoy each one! And please, if you have trouble running Ms. Info, feel free to leave a comment!